Augusta Davies was born in Dorset in 1837, the daughter of a naval officer. She pursued an unusually progressive course of education for a young girl, studying Greekostensibly to help a younger brotherand taking a particular interest in Greek drama. During her long career as a writer, she published more than a dozen volumes of verse, as well as many social and political essays concern-ing women's rights and responsibilities. In 1863 Augusta married Thomas Webster, a fellow (and later law lecturer) at Trinity College, Cambridge. They had one daughter. Much of her work published thereafter concerns the difficulties and complexities of forming a happy marital union. Webster was the first female writer to hold elective office. She worked tirelessly for womens suffrage, and in 1879 and 1885 was elected to the London School Board. 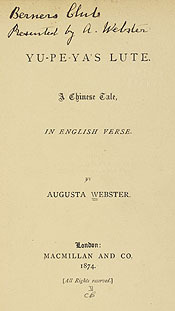 Yu-Pe-Ya's Lute; a Chinese Tale in English Verse. London: Macmillan, 1874. Presentation copy inscribed by the author.